In stock -This product will ship today if ordered within the next 1 hours and 41 minutes. 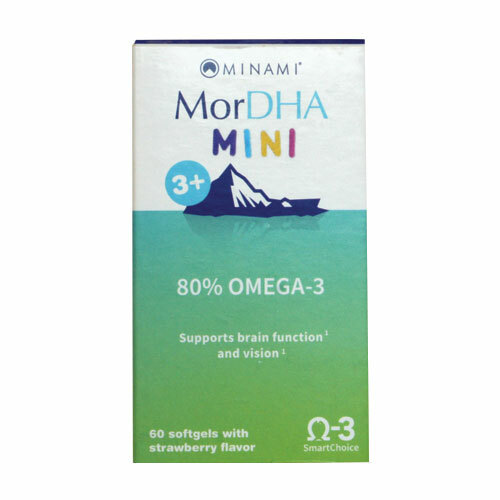 Minami Nutrition MorDHA Mini IQ is a 80% concentrated Omega-3 fish oil supplement containing 54mg EPA and 250mg DHA per soft-gel. For the development of the brain and eyes. Children’s diets today are notoriously low in the beneficial Omega-3 fats found in foods such as fish. This makes supplementation an especially important option for parents. Compare this amount of DHA per softgel with other brands and you will realize why consumers agree that this is highest concentrated DHA rich product on the market. Gluten, Dairy and Lactose FREE. Deep-sea fish oil concentrate (from anchovy, sardine and mackerel), fish gelatine, humectant: glycerol, strawberry flavour, evening primrose oil, antioxidants: rosemary extract and tocopherol-rich extract (Miradoxen). Store in a cool, dry place (max. 25°C) and protect from sunlight. 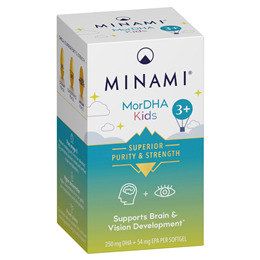 Below are reviews of Minami Nutrition MorDHA Mini - Children - 60 Softgels by bodykind customers. If you have tried this product we'd love to hear what you think so please leave a review.